Can Skoda's new family hatchback seriously take on established players such as the Ford Focus and Hyundai i30? You’d be forgiven for not being awfully familiar with the Skoda Rapid, a car which, while certainly decent, lacked soul in our humble opinion. It also sat in an odd segment, between the Fabia and the Octavia, making it not quite a VW Golf rival but not a supermini either. It was sold in two bodystyles, the Rapid and Rapid Spaceback, and worldwide, was the second biggest seller for Skoda after the Octavia. The same wasn’t true of the UK, with sales amounting to a modest 3669 units in 2017. But enough background. What we’re driving here is the new Scala. The Scala is an indirect replacement for the Rapid – bringing a new name and an entirely new game, if Skoda is to be believed. Scala comes from the Latin word meaning ‘stairs’ or ‘ladder’, chosen to help reflect the fact that the model will be a “a leap forward in design and technology,” according to the Czech brand. The Scala won’t be offered in two bodystyles like its predecessor, with Skoda choosing to focus on the hatchback, a style which remains incredibly important in Europe. It is also being pitched more directly as a family hatchback rival, intended to take on the likes of the Ford Focus, Hyundai i30 and Seat Leon. That means an overhaul: in design, in dimensions and in its offering. Skoda has previously told Autocar that it will be the first model to receive a new generation of interior and will offer “innovative features that have so far only been seen in higher segments”. It’s also the first European model to bear the Skoda name in lettering on the back replacing the logo, a move that Skoda has identified as making its cars appear more upmarket. It also helps buyers who are less familiar with the brand and the logo – such as in the crucial Chinese market – recognise the car as Skoda, reckons the maker. 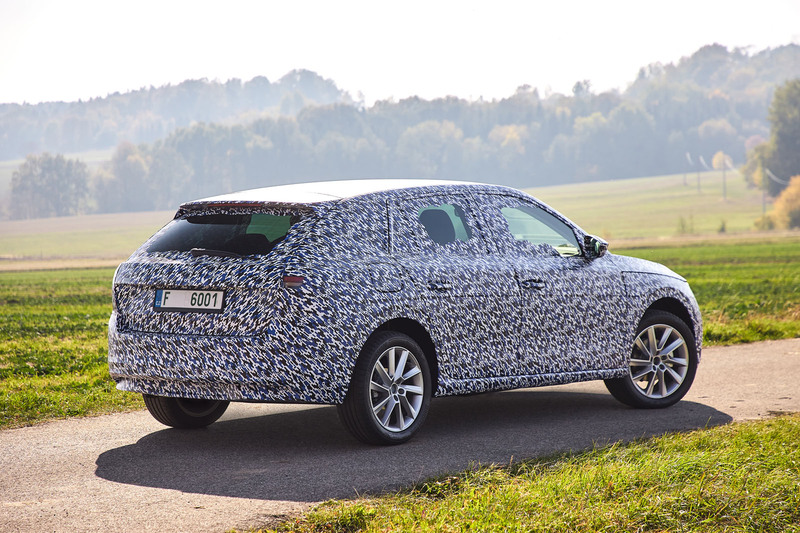 The Scala won’t be officially revealed until December, so we drove a prototype version, which isn’t far from final. If you could ignore the camouflage and lack of interior (more on that later), there’s little behind the wheel to suggest this is anything but a production-ready model. 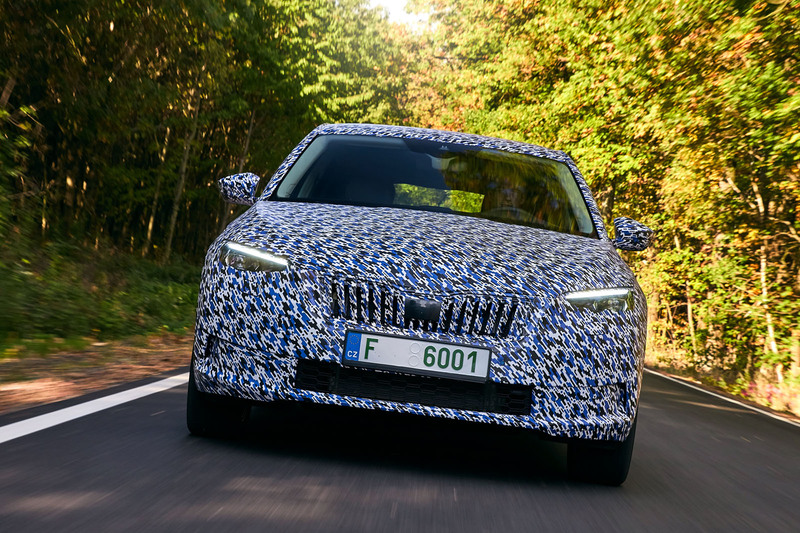 If you were blindfolded, it’s hard to tell it apart from many other Skodas – and indeed Volkswagen Group models – which, while it might not be original, is exactly what Skoda is aiming for. When we commented to an engineer that it felt like other Skodas, he was glad, describing it as the “Skoda DNA”. The chassis set-up is comfortable and given that Czech roads are as rough in places as the UK, it’s a fair measure of its capabilities. Skoda will offer an optional Sport Chassis Preset configuration, which makes the car 15mm lower and adds a more sporty dynamic to the set-up. We tried both possibilities and, naturally, the standard model is far more comfortable. It’s hard to imagine that many Scala drivers will want the harder ride of Sport Chassis Preset, but Skoda assures us it will be very popular in some markets, albeit not the UK. Steering, while not yet finalised, is light and has the vagueness of many modern VW Group cars. Nonetheless, it’s effortless in most driving scenarios and, importantly, will suit most buyers of this sort of car. In the few corners we experienced, the car handled respectably and will more than suffice in this kind of car. (If a Scala vRS was coming – and we’re told it’s not – it’d be a different story of course…) Keen drivers will still prefer the Ford Focus. We spent most time in the 1.5-litre TSI, but there will also be a 1.0-litre TSI and 1.6-litre TDI. On start-up, the 1.5 sounded momentarily gruff but once up to speed became unnoticeable. With noise-cancelling materials not yet finalised in the car, this complaint isn’t likely to carry over to the production car. The 1.5-litre will be the most popular in the UK, followed by the 1.0-litre TSI. The 1.5 TSI is the sweet spot with ample power driven through a six speed manual (or optional seven-speed DSG), while the 1.0-litre regularly needs changing down on anything but the flattest of roads. The interior is a major point of note in the Scala. Completely taped up in our prototypes, we’re told the interior will closely mirror that in the recently revealed Skoda Vision RS concept. That includes an optional 9.2-inch touchscreen - the largest in the segment, and over-the-air updates include maps, in-car web apps, internet radio and four USB-C ports. It’s also the first Skoda to be online permanently thanks to a built-in SIM card, providing high-speed internet connection. There’s also a host of driver assistance systems. As well as the adaptive cruise control, lane assist and lane change assist, there is also park assist and rear traffic alert, both unusual in this segment. Skoda prides itself on practicality, and has made the Scala as practical as possible. In almost all dimensions, it’s larger than rivals such as the i30 and Focus, meaning more room in the rear (a six-foot tester was satisfied) and big boot space. The Scala has 467 litres, compared to the Focus’ 341 litres, plus plenty of nets and a variable floor. The jury’s out until we try the final version on UK roads, but it’s a promising start. The Scala is unlikely to set hearts on fire, but it’s a generous step up from it’s predecessor and will appeal to many hatchback buyers, thanks to its well-designed interior, advanced levels of technology and value for money, all of which help give it an edge on its many rivals. If that car looks as boring as I suspect it does under the camouflage, it's going to be a serious disappointment compared to the show car. I think Skoda will look back and see this as a missed opportunity delivering what the market expects of a Skoda, rather than what it could be (and the concept car was really very good). Fingers crossed I'm wrong. I am on my 3rd Skoda, an Octavia Scout, reliable, fast, economical but purely functional and efficient, I really wanted the new Superb as I think it looks great but as I drive in snow alot I wanted increased ride height, VAG bosses will not allow a Superb Scout as they fear it will steal sales from their allroad models, and it would, Skoda had one ready for production but they were ordered to cease. The same will have happened here, they can only produce what their German masters allow and anything that threatens to be more attractive than an Audi or VW is canned. I have also owned 2 Audis, one an Allroad which was ridden with faults. If I look at every part on my Scout it has a VAG production mark on it. Why would I pay another 10K just to have slightly better carpets and 4 rings on the grille. I keep that for my classic 911 that has way more character and fun than any new Audi. What can you see that the rest of us cannot?. Upload an accurate rendering of this car you suspect of being boring and we will see if you are right...what a wet blanket you are, driving your very exciting non boring fleet of amazing cars. This is an A0 MQB based car by Skoda's own admission. How can a car based on the supermini platform of the VW Polo challenge the Ford Focus? What a disappointment. All the promise of the recent Vision RS concept dashed by this preview of the productionc car. It looks staid and frumpy by comparison - closer to the Rapid that we were led to believe. Maybe it won't look quite so lumpen when it's fully revealed. I like Skodas and own one myself, but I sense we may have reached 'Peak Skoda' with the Superb and current Octavia. Although launched in the same year as the Octavia, the Rapid was based on the VW Group's previous supermini platform rather than the smaller version of (the much newer) MQB platform which underpins the group's current superminis (bar, bizarrely, the Fabia). This not only made the car slightly smaller than the Octavia it made the Rapid cheaper too and yet despite this many buyers still opted for the more modern, plusher and much more expensive Octavia when plumping for Skoda's Golf rival. God knows what the sales ratio is but I barely see a Rapid yet see loads of current Octavias! And yet Skoda is repeating the same trick with the Scala, basing it on the smaller (original) MQB platform, not long before the Mk4 Octavia is revealed which will benefit from the newer version of MQB. And I suspect the sales ratio will be more or less the same too with the Scala in the UK at least. And it's not just Skoda, SEAT done the same with the Toledo and yet hardly anyone buys it, instead going for the much more modern, expensive and far better Leon. 1. Eat 13 cans of sardines, including the oil. 2. Stitch my eyelids to a greyhound the day before a big race. 3. Work as a forensic flatulence investigator at an aged care facility for 10 years. 4. Listen to the complete back catalogue of Lady Gaga. 5. Give Geoffrey Rush a full body massage with a happy ending. 1. Eat 13 cans of sardines, including the oil. 2. Stitch my eyelids to a greyhound the day before a big race. 3. Work as a forensic flatulence investigator at an aged care facility for 10 years. 4. Listen to the complete back catalogue of Lady Gaga. 5. Give Geoffrey Rush a full body massage with a happy ending. We all wish you would do all of these things and stop being such a bore.